The Internet is amazing. It's also made us terribly lazy when it comes to remembering things. 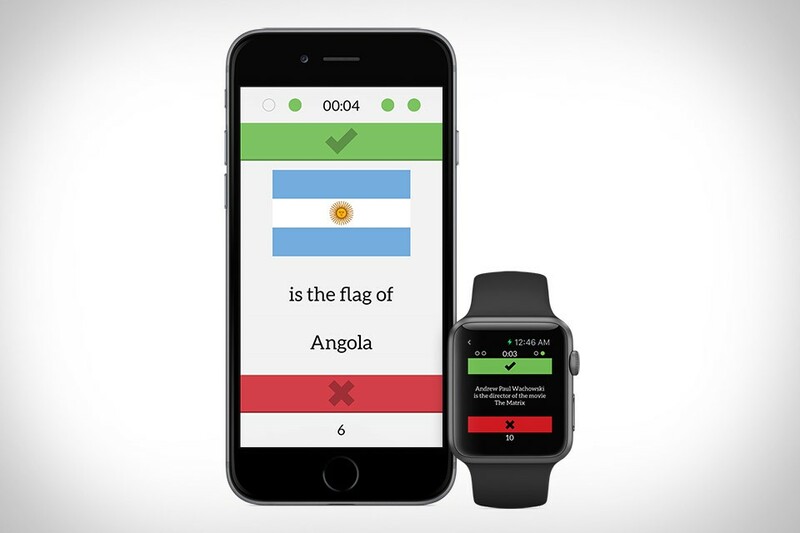 Reclaim your trivia talents with Elementary Minute. This fast-paced quiz game gives you a limited amount of time to answer questions about math, people, and places, with a simple interface and helpful statistics and review features. Two game modes are available — either answer as many questions as you can in a minute, or try to get as many questions correct as possible without using up your four lives — and it's compatible with the Apple Watch, so you don't even need to dig out your phone to get in on the game. Back in the pre-iPhone days, a little gadget called the Pacemaker Pocket DJ made a big impression — it was the world's first portable DJ system. Now you can get the same functionality right on your wrist. Pacemaker lets you mix, loop, blend, and drop all you want, using tracks from your own music library or any of the millions of tracks on Spotify, on your iPad, your iPhone, or, for DJs that want to roam the floor during sets, your Apple Watch. Best of all, it's completely free to try, with only the well-built effects costing you any coin. Gear. Style. Cars. Tech. Vices. 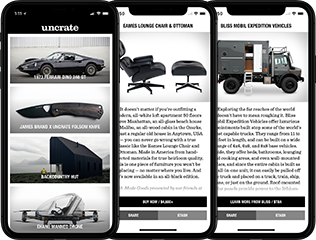 Get your daily dose of it all with the Uncrate app. We've just released version 2.0, which sports a completely new design, iPhone 6 and 6 Plus optimization, and all kinds of under-the-hood improvements. New stuff is added every day for your perusal, and you also get quick access to your stashed items and magazine subscription. You're really missing out if our app isn't on your home screen. We knew it was coming — Apple didn't buy Beats to make headphones, after all. Now Apple Music is here, and it's aiming to be the only music app you need. Folded into the app are a new streaming service with access to over 30 million songs and artist-curated playlists, a new 24/7 radio station hosted by some of the world's best DJs, and a new feature called Connect that lets you follow artists both mainstream and underground, with the ability to like and comment on everything from songs and videos to lyrics and backstage photos. Of course, it also gives you access to all your existing music and playlists, too, and gives intelligent suggestions for new tunes based on your already rich listening history. Arriving for iOS and Android. Learn More from Apple / $10/mo. Even the best alarm clocks can't compete with being awoken by a human voice. Thanks to Wakie, you can ease into your day talking to another person, even if you're hopelessly alone. This novel app connects you to an entire network of people that set their alarms not to be jarred out of slumber by alien buzzing, but by receiving a call from another member of the network, who will have a friendly one-minute conversation with them to start their day. You can also choose to be on the waking end of things, calling other members to help them out of bed. We've all got things we'd like to do more often, like read, learn a new language, or just take better care of ourselves. Streaks gives you a little added motivation to do so. Like a fitness tracker for everyday life, it gives you six slots to fill with simple actions you'd like to become daily routines, covering everything from practicing an instrument to taking a photo. It integrates with the Health app, too, so you can still set fitness goals if you'd like, and has customizable reminder notifications to give you the extra push you need.